The humble mushroom is set to become not just one of the biggest new food and wellness trends but could have significant and powerful uses in medicine too. New studies are resulting in some surprising conclusions, with mushrooms now receiving global recognition for their health and healing qualities. Industries from food to wellness to beauty are taking notice, and mushrooms are even being hailed as beneficial in the treatment of degenerative brain diseases. Mushrooms play a vital role in the Earth’s ecosystem. They are neither an animal nor a plant, and spread under our feet like a vast underground network (known as mycelium), only popping into view as they emerge like the tip of an iceberg above ground. It is their decomposing properties that make all life on our planet possible. While Asian and Eastern countries such as Japan, China, and Russia have harnessed the immense power of mushrooms for centuries, using them in both food and medicine, the rest of the world is only just catching up. At the recent Global Wellness Summit, Dr. Andrew Weil described the health benefits of mushrooms ‘phenomenal’. And when we look at the mounting evidence being brought forward, it is clear that mushrooms can be used to combat everything from cancer to infections, preventing dementia, re-growing nerve cells, slowing down the aging process, and having enormous effects on conditions such as depression and addiction. Seeing mushrooms as a medicinal substance is not a new phenomenon. We only have to look at penicillin, which has saved more lives than other medicine, to appreciate the power of the fungi. And, as noted above, Eastern medicine has used mushrooms in treatments for hundreds of years. Different species of mushrooms have different properties that can be used to improve body and brain health. In general, they contain polysaccharides and beta-glucans, which help the immune system. They’re a powerful natural source of Vitamin D, they stabilize blood sugar and they fight inflammation. Meanwhile, mushroom species such as reishi, cordyceps, chaga, lion’s mane, and maitake are adaptogens. What this means is that they can aid our bodies in fighting biological, chemical and emotional stressors. 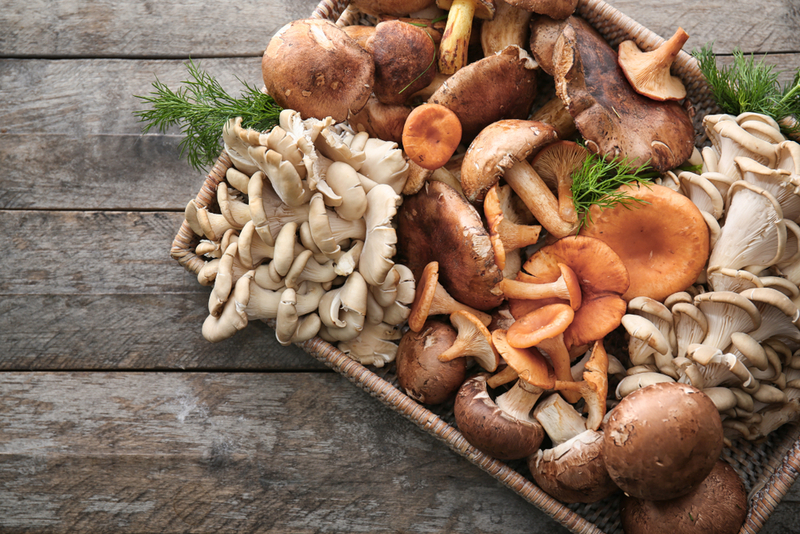 A recent study by Penn State University has revealed that all species of mushrooms contain anti-aging antioxidants ergothioneine and glutathione, which can help in the fight against illnesses such as cancer, coronary heart disease, and Alzheimer’s disease while keeping the brain healthy. The popular species of wild ceps and porcini are particularly renowned for their high antioxidant content. This may even be proven to be a factor in the far lower rates of neurodegenerative diseases like Alzheimer’s and Parkinson’s in countries such as France and Italy, where large numbers of mushrooms are consumed. One of the more controversial mushrooms out there is the ‘magic’ kind. The 200 species of hallucinogenic mushrooms contain psilocybin, which evidence is showing, alters the brain by forging new neural pathways. Ancient civilisations have used them for centuries, and in the 1960s studies began in earnest on the uses of them in the treatment of depression and addiction. These revealing studies, however, came to a grinding halt when many countries classified magic mushrooms as highly illegal drugs. Today, however, the research has been ignited once more, and the findings are revolutionary. Top universities from Imperial College London to the University of Zurich, Johns Hopkins and UCLA are studying the effects that these powerful little fungi have on everything from depression and anxiety to PTSD, end-of-life distress and addiction. Psilocybin is being shown to reset the brain, leading to drastic improvements in conditions where the brain circuitry may have become ‘rigid’ or inflexible. Incredibly, just one dose can last for weeks or even months. One study into end-of-life distress proved 80% of cancer patients showed dramatic reductions in anxiety when treated with psilocybin, with two-thirds of participants rating it as one of the most spiritual experiences of their lives. Another study showed that after two psilocybin treatments, 80% of heavy smokers had still quit six months later. The mushroom trend is booming, and we are seeing an uptick in health foods infused with mushrooms across the globe. New processes are making it easier to extract those all-important adaptogenic nutrients, which mean that mushrooms are appearing in everything from coffee and cocoas to chocolate, teas, and oils. It won’t be long before the mushroom latte is as commonplace as a flat white. The beauty industry, too, is jumping on the trend. Mushrooms are being shown to work in many ways to restore youthful skin and repair skin cells. Chaga, Chinese cordyceps and tremella mushrooms, for example, are natural anti-oxidants, which repair skin cells and work as collagen boosters, skin tone eveners and super-hydration. While many Asian beauty companies have long been using mushrooms as a key ingredient, the practice is now spreading, with top international brands harnessing their powers. Mushrooms are among the oldest organisms on the planet. Scientists estimate that we have only identified some 5% of the approximately 1.5 million mushroom species that exist, and so the opportunities are endless. In the future, it may be possible to use mushrooms as a weapon in the battle against toxic waste, as they decompose everything from hydrocarbons to oil, petroleum, and pesticides. Could these unassuming fungi be the answer we’ve been looking for when it comes to halting global warming? The possibilities are being studied, but if the evidence from current research is anything to go by, the future looks promising.